Age-related hyperkyphosis affects 20-40% of older adults and can be described as an exaggerated anterior curvature of the thoracic spine that is associated with aging (increasing incidence 6-11% for every 10 years of increasing age). General causes of age-related hyperkyphosis that have been reported are poor posture, dehydration of the intervertebral discs and reduced back extensor muscle strength. Lead to mobility impairments of the rib cage (connected to thoracic spine) which can result in pulmonary difficulties. Have an impact on the basic functioning and daily living, which affects the quality of life. Cervical Spine: it contains 7 vertebrae (C1-C7) and has a lordotic curve. This region has the greatest mobility. 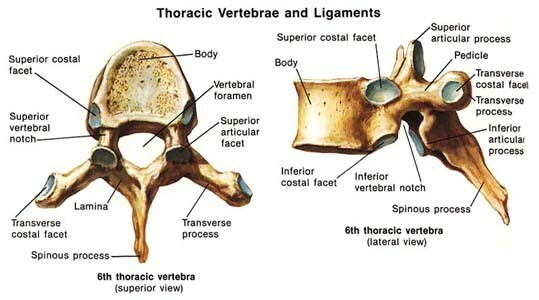 Thoracic spine: it contains 12 vertebrae (T1-T12) which are connected with the ribs. And the thoracic spine has a kyphotic curve. Lumbar spine: it contains 5 vertebrae (L1-L5) which are the largest and strongest. The lumbar spine has a lordotic curve. Sacrum/coccyx: the sacrum contains 5 fused vertebrae (S1-S5) and the coccyx 4 (sometimes 5) fused vertebrae. They have a kyphotic curve. Hyperkyphosis is most common in the thoracic spine. The thoracic spine is relatively stiff compared to the rest of the spine, because of the rib cage, ligaments and the thin, rigid intervertebral discs. The thoracic spine has frontal orientated facet joints which allow flexion and extension but these movements are small because of the limitation of the rib cage. Lateral flexion and rotation need translation in these joints. The rotation in the thoracic spine decreases with flexion, so hyperkyphosis limits the 3D movement. There are ligaments between the ribs and vertebrae and these ligaments limits the rotation of the thorax but only in the transverse plane. Hyperkyphosis changes the posture, plane; more flexion (more hyperkyphosis) results in more instability. So the ranges and patterns of coupled motion of the thorax appear to be strongly influenced by the posture from which the movement is initiated. Thoracic kyphosis varies in life between 20-29 degrees. Incidence and prevalence of hyperkyphosis vary between 20% to 40% among both men and women. After the age of 40 the kyphotic angle begins to increase usually more rapidly in women than men. The angle varies between 43 to 52 degrees in women aged 55-60 years to 52 degrees in women between 76-80 years of age. Thoracic Hyperkyphosis is recognizable by different symptoms, the main one being an increase in the anterior curvature of the thoracic spine (more prominent upper back). This can come over time and isn’t always detected by the patient, but rather by his friends and family. When a person has a sudden increase of rounded back, it is necessary to go see a doctor. Sudden changes in the spine curve can be associated with other health problems. Along with this physical characteristic, people with Hyperkyphosis tend to have more difficulty rising from a chair without their arms, have a poorer balance (they have the feeling that they might fall), slower gait velocity, wider base of support with stance and gait (to avoid falling) and decreased stair climbing speed. In severe cases of Hyperkyphosis, people can have trouble breathing, because of the loss of vital capacity of the lungs. The most validated method for assessing thoracic kyphosis is standing lateral spine radiographs. Elderly subjects can also do this in the supine position for more comfort. From these radiographs the Cobb’s angle of kyphosis can be calculated from perpendicular lines drawn on a standard thoracic spine radiograph. One line extends through the superior endplate of the vertebral body, marking the beginning of the thoracic curve (usually at T3/T4), and the other line extends through the inferior endplate of the vertebral body, marking the end of the thoracic curve (usually at T12). 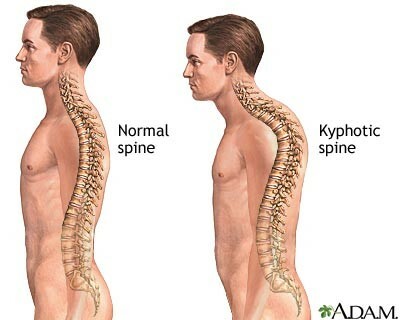 When the angle is between 20-40° we consider it as a normal kyphosis, higher angles are considered as hyperkyphosis. However, there can be an overestimation of the kyphosis in the presence of vertebral body end-plate deformation or fracture. In this case there is an alternative method for measuring the Cobb’s angle. In this alternative method the Cobb's angle is measured by extending lines from the mid-points of the superior and inferior end-plates of T4 and T9. 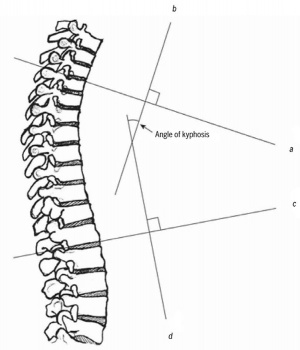 The kyphometer measures the angle of kyphosis. The arms of the device are placed at the top and bottom of the thoracic curve (spinous processes of T2/T3 superiorly, and T1/T12 inferiorly). Using a mathematical formula we can strongly correlate with the radiologic measured thoracic Cobb’s angle. The flexicurve ruler is a flexible ruler that is aligned over the C7 spinous process to the L5–S1; the ruler is molded to the curvature of the spine. The kyphosis index is calculated as the width divided by the length of the thoracic curve, multiplied by 100. A kyphosis index value greater than 13 is defined as hyperkyphotic. There is a reasonable correlation (ICC = 0.68) between a radiologic and standing clinical measurement of kyphosis. Measurement of the number of 1.5-cm blocks needed to support the head. There are no studies comparing these measures to the gold-standard radiograph. Pharmacological treatment focus on anti-resportive or bone-building medication because many patients with age-related hyperkyphosis have low bone density or spine fractures. There are two surgical options: vertebroplasty and kyphoplasty. These options mainly help relieve pain and decrease physical disability, but in some cases, surgery can reduce the kyphosis angle. The produce involves injecting a balloon in the fractured vertebrae, which will be inflated so that it pushes the broken parts to back their initial place. When the balloon is removed, a cement gel is injected to harden and stabilize the bone. The balloon is injected with a tube and the incision is made in the back, the tube passes from the back to the fractured spine. The risk of this surgery is that the cement can leak, and potentially damage the spinal cord. This surgery has the same risk as a kyphoplasty, namely leaking fluid and potentially damaging the spinal cord. A 2014 systematic review of exercise for age-related hyperkyphotic posture concluded that there are few high-quality studies suggesting a modest benefit (1.67°-3.74° decrease of hyperkyphosis) for exercise compared to control. (Level of Evidence = 1A) Ideally these exercises should (initially) be supervised by a physical therapist or certified instructor in order to be effective and safe. The exercise modalities and dosage should be adapted to capacities and needs of the individual patient. Postural correction training through stretching, and strengthening exercises to help reduce the hyperkyphotic curvature and prevent the condition from advancing. Breathing exercises to help improve tolerance for physical activity by increasing lung capacity. Pain management using modalities such as heat, ice, and/or electrical stimulation such as transcutaneous electrical nerve stimulation (TENS). Myofascial/soft tissue manual therapy (using hands-on techniques) and shoulder mobilization to help improve spinal flexibility. Education to improve posture and activities of daily living and ease physical functioning. Have the patient try this him/herself, the first time still going over every cue. Once the patient has practiced the posture a sufficient amount of times to immediately be able to resume good posture on command, taping and random reminders (timer) can be used to ensure the posture is kept during the day. ↑ Jang et al., H. (2015). Effect of thorax correction exercises on flexed posture and chest function in older women wih age-related hyperkyphosis. J. Phys. Ther. Sci. , 27, 1161-1164. ↑ 5.0 5.1 Mulligan et al., B. (2015). The Mulligan Concept of Manual Therapy: Textbook of Techniques. Chatswood, NSW, Australia: Elsevier. ↑ Edmondston et al., S. (2007). Influence of posture on the range of axial rotation and coupled lateral flexion of the thoracic spine. Manipulative Phys Ther , 30 (3), 193-9. ↑ Fon et al., G. (1980). Thoracic kyphosis: range in normal subjects. AJR Am J Roentgenol , 134 (5), 979-83. ↑ Lewis et al., J. (2010). Clinical measurement of the thoracic kyphosis. A study of the intra-rater reliability in subjects with and without shoulder pain. BMC Musculoskeletal Disorders , 1 (11), 39. ↑ 9.0 9.1 Hinman et al., M. (2004). Comparison of thoracic kyphosis and postural stiffness in younger and older women. Spine J , 4 (4), 413-7. ↑ 11.0 11.1 11.2 Goh et al. (2000). A comparison of three methods for measuring thoracic kyphosis: implications for clinical studies. Rheumatology , 310-315. ↑ Korovessis et al. (2001). Prediction of thoracic kyphosis using the Debrunner kyphometer. J Spinal Disord , 67-72. ↑ Teixeira et al. (2007). Reliability and validity of thoracic kyphosis measurements using the flexicurve method. Brazilian Journal of Physical Therapy , 199-204. ↑ Kado et al. (2006). Comparing a supine radiologic versus standing clinical measurement of kyphosis in older women: the Fracture Intervention Trial. Spine , 463-467. ↑ Petcharaporn et al. (2007). The Relationship Between Thoracic Hyperkyphosis and the Scoliosis Research Society Outcomes Instrument. Spine , 226-231. ↑ 17.0 17.1 17.2 17.3 Pradhan et al., B. (2006). Kyphoplasty reduction of osteoporotic vertebral compression fractures: correction of local kyphosis versus overall sagittal alignment. Spine , 15 (31(4)), 435-41. ↑ 18.0 18.1 Hulme et al., P. (2006). Vertebroplasty and kyphoplasty: a systematic review of 69 clinical studies. Spine , 31 (17), 1983-2001. ↑ 19.0 19.1 Wardlaw et al., D. (2009). Efficacy and safety of balloon kyphoplasty compared with non-surgical care for vertebral compression fracture (FREE): a randomised controlled trial. Lancet , 373 (9668), 1016-24.